Our Co-CEO, Vlad Nanu, gave some insight to Business Leader magazine on solving development resource issues. The face of technology is changing. Not just within the tech vertical itself but the way technology is used across all industries; education, finance, healthcare, and the list goes on. Furthermore, each vertical within a business is looking for ways technology can be utilised to improve processes, accountability and responsibility. Whether that’s developing a new piece of software or investing in a digital transformation strategy for the way a business monitors and manages information. However, what this then results in is a gap in resource. It’s understood that technology employers expected to face a moderate skills shortages in 2019, according to research by Totaljobs.com, and it’s unlikely this trend will change overnight. Encouraging young talent to pursue a career within software engineering has been pushed at a far too later stage, meaning that the supply of talent can’t keep up with UK demand. The other issue being faced is how software development requirements are forever changing. Where a project requires a particular programming language or skillset during the initiation of a development plan, this can alter as the scope and requirements change. For example, a project initiated three years ago, most likely did not plan to use cloud or mobile technologies. This really only gives businesses one option – to outsource their software development needs to software houses. They can therefore keep up with new technologies, and train new developers while providing excellent service to their customers. Nevertheless, this should be embraced as it can also give companies flexibility and the opportunity to scale much faster. They can also focus on their core business more than if they spent the time hiring talent based on each individual requirement. When making the decision to outsource, there is a highly functional solution and many IT leaders are missing a trick as a result. It is understandable why businesses would rather not outsource their development needs; a range of issues come to mind, such as data security, intellectual property, control over the development process and so on. However, there can be a happy medium – where you can get a healthy balance of internal talent blended with external resource. If businesses were to build a software development function in-house but then invest in team augmentation to meet their skillset needs, then they can have the best of both worlds. The internal resource gives a layer of accountability and control, but the external resource or ‘extended team’ gives the business access to immediate skillset and scalability. This is a result of there being no lengthy hiring process when looking to extend software resource, but an immediately available pool of talent who already understand the project and company culture. The other benefit is knowledge transfer; because of the UK skills shortage within software engineering, people with these qualifications are never short of work so there is nothing stopping your internal developer from snapping up another role leaving you in the lurch. But by having an external partner delivering your software development needs, you can always be rest assured that there is someone on-hand to pick up the pieces and communicate information to a new hire – quickly and efficiently. It’s no different to a business using a PR agency to handle their public profile and brand awareness strategy, or outsource finance to an accountants firm. They can utilise the expertise, experience and depth of talent the agency has but still have a degree of autonomy by hiring a PR manager internally, or use the expertise of trained accountants while having a CFO or financial controller in-house. 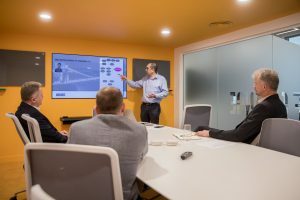 At Amdaris (https://www.amdaris.com), we recently moved into the heart of Bristol, and it’s evident there is a wealth of innovative businesses which are relying on software development resource. Similarly, large enterprises are developing their processes, which require investment in software engineering skillsets. The rate of change in software and technology is exponential; when you observe the rate of growth in just the last decade alone with everyday tools such as the internet and mobile phones. As a result, businesses need to be prepared for this and extended team resource could just be the answer.